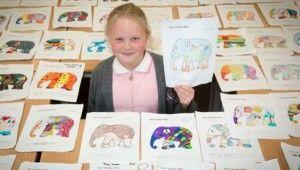 THREE children from Thurrock schools Aveley Primary, Herringham Primary Academy and St Thomas of Canterbury Catholic Primary have been chosen as the winners of a design competition to create new elephant statues to join the Elephant Parade at intu Lakeside this May. After reviewing hundreds of entries from each school, the winning designs were selected by a judging panel comprising of representatives from the shopping centre, the schools and the local media. The young winners will now get to paint their very own elephant statues which will stand shoulder to shoulder at intu Lakeside from 5th May with those by top artists and celebrities, including Claudia Schiffer and Union J. Elephant Parade is a global public art festival, which brings together the worlds of art, business and charity to create vibrant public art elephant statues that are sold or auctioned to raise money for the Asian Elephant Foundation. The tour has been made possible by intu, the UK’s leading shopping centre brand, and the elephant herd will be visiting intu shopping centres across the country over a 14 month period, including intu Lakeside between 5th May and 1st June 2014. For more information about intu Lakeside’s Elephant Parade please visit www.intuelephantparade.co.uk.